Writing about travel tales all this month on my blog. Hello! Today's post is about loving yourself despite your limitations. My L post is up in the Lexicon of Leaving. And its Laughter. Letter L: Laulau "My stomach flipped and I suddenly felt like I was standing at the top of Black Rock again, ready to jump. And I was going to go for it..."
Out of the blue... i have a post for the alphabet 'L'... Do read.. Illegal Aliens is blogging all things Roswellian as it launches Illegal Aliens, a Roswell Podcast. 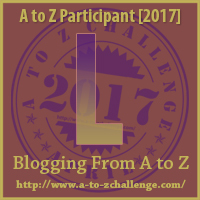 Today L is for Liz Parker. So I really need your help with a tricky question on this one. We all need a giggle now and again and Amble Bay's the place to enjoy one! Today we are meeting at the lake. Don't be late! Today’s topics: Leadership, Lighthouses, and Lions. I'm not understanding why my links work on some days and not on others. I am using the same formula. For the last two days I haven't been able to get Blogger to publish my comment. I have been back over my coding and it is the same for every post. Any insight into why I'm experiencing this issue? Works perfectly on Wordpress but I don't want to limit the exposure of the challenge contributions. I'm not one of the Facilitators but I'm having the same problem as you. I've tried recopying the original coding from the source instead of reusing my copy on my computer and usually that works. Some days nothing will work. It worked today. I always put the link in first and preview it before adding any other comments. We're sorry if you guys are having issues with posting your links on the blog. I'm going to blame Blogger itself for this problem with the links working some days and not others. At this point, my suggestion is to copy/paste your actual link in your comment and don't worry about making it 'clickable'. The most important part is to get people interested in your post to come visit. Best of luck with the Challenge. I had the same problem - erratic acceptance of my clickable link, and I'm on blogger not wordpress. Typing out the code here in the comment box rather than copy-paste has helped so far. No idea of the inner workings. Might be worth trying. Read about lukewarm Laodicea in today's post! Today L is for Ada Lovelace. Ok here's The Way I See It...L is for Life. And yes, I just realized today should be letter K...well mistakes are part of life. K will be tomorrow for me, rebel that I am. Facts and Fiction-Family Stories. Read about Linden Railway Station and its Stationmasters. L is for the LOVE of Music!!! As writers, we need to have perspective. We need to see our own growth. Let's look back and see where we came from to know how we got here. Today we learn about some very scary mice. Today's blog post is all about stupid blogging mistakes, and how you can prevent them! Writing still getting on your nerves? 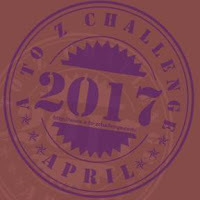 Are you struggling to get through the challenge? Come have a laugh! Loving yourself is not a vanity, but a sanity! And this sanity within, can make the life beautiful. Love Yourself is a short story that reiterates the same. Happy falling in love with self! Team MocktailMommies wishes all a Happy Vishu and the new year! My favorite TV Doc wrote a book! Sharing some blog love for Letter L.
Today we have guest poster Brandon Ho. When ghosts are haunting your house. Who you gonna call? A lawyer. At least, that's the entirely true story in Legally Haunted today on the Wolf of Words. Throwing rocks at a hero who has been written up a tree! Use lovely lavender when writing love letters. The thoughts of an over-ambitious scientist. Theme: Build a Better Blog. Looking forward to seeing if I've managed to follow your guidelines well enough for the link to work today. Also need to learn how to put the badge on. Have managed in previous years but not having blogged since this time last year I'm having to relearn how to do it. Nearly halfway! Where did the weeks go? Oh I didn't start till a week late so in reality this month will be a week short for me. Hope everyone's having a blast, I am. There is a child lost in the store. Oh ... and there's a bit of my short fiction to go with it. Enjoy! Today on my A-Z of my Favourite Things, L is for London. L is for Lorry The next chapter in my continuing story. L is for The Princess and the Legendary Lemon. Also, pretty dancing princess here. Letter L: Little Red Riding Hood. Do you like fairy tales? Today is Feline Friday, and the cats are Loving their prize! The link isn't working for the post, but I was able to find your post on the blog! Are you listening or are you speaking? I'm building an artful life. Retiring at the end of next week so hoping to build even more art practice into my life. Visiting the Grand Duchy of Luxembourg. How much of 1992 do you remember? Check out my '92 Time Capsule! I'm listening to the other side. A Maine vanity license plate L and a poem to go with it. Today's What if...? Liar, liar, pants on fire! L is for the LEGO Store! L is for Let it Grow. Talking about letting your writing happen naturally. Letter: L is for Lots of Author Book News!!! Today's haiku puzzle is a two-fer, so you get TWO chances to figure out the word from the haiku! To see my quick, fun, easy puzzles, visit WordWacker . L is for Listen The importance of listening to staff, community and more! At Girl Who Reads, I share some sites where you can Learn About Literature by listening to recorded lectures from top universities. Theme: Writing prompt a day, great for story starts, deepening existing projects, as a warm up, or to overcome creative burnout. Here is a link to my post for L from my blog Weekends in Maine. Thanks for visiting! L is for LooHoo | Add some fun to your laundry routine with wool dryer balls. L is for lunches! What kind of things do you like to eat while traveling?!? Anyone else slowing down or is it just me? Letter L : Take cover in La Yacata when Lightning strikes! Post: L is for “Longest Book” What’s the longest book you’ve ever read? L is for Leda & Leto! I have a 3-day weekend!! Do you wanna be little again? I'm LATE this morning to LINK up. I hope this isn't LETHAL for Curious as a Cathy. I urge you to not lolligag around. Hop over to check out today's edition of Art Sketching Through the Alphabet with the letter "L" (lighthouse & laughing cat). Happy A2Zing! L is for light bulb -crocheted catnip toy. L is For Languages. . I am using Amy Krouse Rosenthal’s “Encyclopedia of Me” to journal daily. Today on Sciency Words: A to Z, why's the Moon so wobbly? Also, a clever Beach Boys reference. I need your help solving a mystery. All the reasons you should relax (and how to relax) to be a better writer. Today's holiday is "Line Dry Your Laundry day"
Today's #AtoZChallenge post is all about length. For Writers, I'll discuss how long the book should be. For Readers, I talk about long-winded picture book titles (that are so good anyway). I'm wondering if I've fallen behind one... Be that as it may, please do stop by and have a go at "Name That TV Show!"